It’s vitally important whenever we think about insurgency to remember that the essence of any insurgency and its most decisive battle space is the psychological. In the 1960s, insurgency was referred to as armed theater, which I think is a really poignant way of thinking about it. 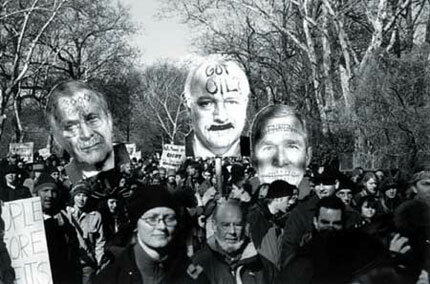 It has been three and one half years since President George W. Bush proclaimed, “you’re either with us or against us.” 2George W.Bush in a joint news conference with French President Jacques Chirac, 6 November, 2001 Since that time the neo-liberal ‘revolution’ has undergone a re-Balkanization in the United States. Gone is the ideology of fluidity and openness that presided over the post-Cold War years and in its place comes a new nationalist spirit complete with rising trade tariffs and a variety of seemingly expedient security measures that have evolved into a new way of life. 3Some who read this sentence will naturally question my use of the term ‘openness’ and point to the harsh political attacks on artists such as Karen Finley, Robert Mapplethorpe and Andreas Serrano among others in the 1990s over their allegedly subversive images and performances. But the so-called ‘culture wars’ was really Neo-Conservative ideology in vitro, whereas for NeoLiberals it was primarily about transforming the National Endowment for the Arts (NEA) as into an institution actively promoting the privatization (commercialization) of culture. From no-fly lists to ubiquitous public surveillance, from severe visa and immigration restrictions to the fingerprinting of tourists, ‘bunker America’ is replacing the fantasy of globalization. Even unilateral military action is justified as a preemptive defense of the homeland. Meanwhile, the rest of the world is offered Pax Americana, a sanctimonious sop revealing perhaps what was at stake all along, nothing less than global supremacy. Less well known at home, however, thanks to guilt-free ‘happy’ news and embedded reporting, is the targeted suspension of habeas corpus and mass cataloging of thousands of Islamic, Middle Eastern, or North African people inside the country. Thousands of individuals have been detained without trial, others deported, and some have been sent abroad into ‘extra-juridical’ zones within Pakistan and Syria where human rights do not stand in the way of extreme interrogation methods. 4The number of people involved is difficult to estimate but an excellent website that includes a database of some who have disappeared is www.disappearedinamerica.org. It comes as no surprise therefore that those who publicly question aspects of the new, homeland-security state apparatus also find themselves victims of government investigation and intimidation. While certainly not on par with disappearances and torture, scores of artists, journalists and academics, including several high school students, have been questioned recently about alleged anti-American activities by a variety of Federal and local law-enforcement officials. In at least one case, the one that concerns this essay, the U.S. government is aggressively seeking to portray a group of contemporary artists known for their politically provocative, yet legal and Constitutionally protected art, as a full-blown terrorist threat to the national security. 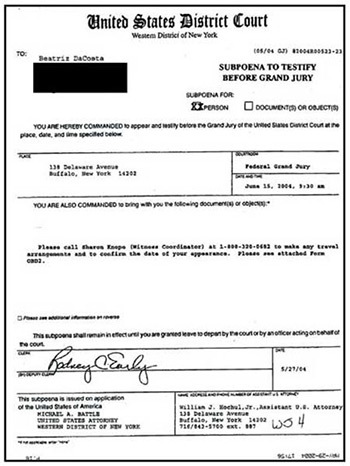 Since 11 September 2001, the FBI and the Secret Service have interrogated gallery curators in Chicago and Dallas for displaying images they deemed suspicious; accused a Nevada man of “borderline terrorism” because he had a bumper sticker that read “KING GEORGE – Off With His Head”; detained and questioned a Colorado highschool principle for permitting students to sing the Bob Dylan tune Masters of war during a public performance; and the culture-jamming group AdBusters were questioned by government agents over a flag-like billboard they installed in Times Square. Secret Service agents even prevented two teachers from attending a Bush rally because they wore t-shirts printed with the words “Protect our civil liberties.” The atmosphere of enhanced public security has apparently also emboldened some local law enforcement to disregard this very advice. Police in Albany arrested a man for wearing a peace sign on his T-Shirt; a young man was arrested outside an Armed Forces Career Center in Boston for dressing up as a U.S. torture victim in Iraq; six men were arrested in Pennsylvania for creating an Abu Ghraib-style human pyramid as the President’s motorcade drove past; and in August 2004 during the Republican National Convention the New York Police Department went so far as to take thousands of people into custody, holding them long past the legal twenty-four-hour limit in appalling conditions at a concrete and steel pier on the Hudson River. Probing callsfrom Federal agents to university administrators have added to a chilling climate of suspicion within academia already apprehensive over Congressional debates about alleged anti-American curricula and over student groups like the ultra-conservative Campus Watch, who openly stake out ‘liberal’ instructors in order to document their so-called Left bias. Professors at universities in New Mexico, Houston, Urbana-Champaign, South Florida, Upstate New York and even Columbia University in New York City have discovered that raising questions about U.S. policy, about Israel, about 911 and homeland security inside the classroom can bring on disciplinary action and even dismissal. Regrettably, several university museum directors at Arizona State University, the City Museum of Washington, and Ohio University have gone so far as to actively self-censor their own exhibitions by removing socially critical work or by adding art that reflects a ‘conservative ‘ point of view. Meanwhile, the firing of several prize-winning journalists effectively demonstrates that challenging Bush administration policy even from within mainstream media can have considerable consequences. 5Details on many of these cases and over a hundred others are compiled by Matthew Rothschild in his McCarthyism Watch Updates published by Progressive Magazine and available online at www.progressive.org. See also: Temporary Services special website on the Resurgence of the Culture Wars at www.temporaryservices.org/culture_wars.html. Incomplete Installation by Critical Art Ensemble in The Interventionists exhibition at MASS MoCA, June 2004: note that most of the work was already in the custody of the FBI. The most alarming of these cases so far is certainly the U.S. Attorney General William Hochel’s unrelenting investigation of artist Steven Kurtz and his former colleague, Professor Robert Ferrell. Kurtz is a professor of art at the University of Buffalo in New York. He is also a co-founder of the Critical Art Ensemble (CAE), an artists’ collective that dates from 1986 which has become known for its multi-media projects splicing Brechtian pedagogy onto the comedic diligence of a Mr. Wizard. 6Mr. Wizard was a popular U.S. television show in the 1950s and 1960s in which an actor, Donald Herbert, demonstrated laboratory experiments for young people. Donning white lab coats and assuming the personae of amateur scientists, they arm themselves with highschool lab equipment as well as common household supplies and groceries in order to demystify, or more to the point, democratize the increasingly privatized worlds of science, technology and information networks. These often-playful routines contrast with the serious intent and analytical approach of the group’s numerous books and manifestos. 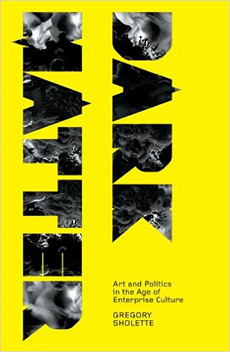 In Electronic Civil Disturbance, CAE celebrates anti-corporate, ‘slacker’ Ludditism and in Digital Resistance they provide plans for making graffiti-writing robots and reprogramming Nintendo games so that children will gain “the means to bring about a situation in which a process of broad spectrum invention, discovery, and criticality can occur” (page 139). Whether in a museum, an international conference, on the street or in print, the CAE’s work unvaryingly aims to inform, entertain and demonstrate the value of public knowledge. For the past several years the group has focused attention on what they see as the misuse of biotechnology by private corporations operating outside the realm of democratic, public debate. CAE’s tactical response is what they term, ‘Fuzzy Biological Sabotage’ or FBS, a type of sophisticated, prank that uses harmless biological agents including plants, insects, reptiles and even microorganisms to operate in the gray, in-between spaces as yet unregulated by institutional regimes. 7See: http://www.critical-art.net/biotech/conbio/index.html and The Molecular Invasion published by Autonomedia Books in 2002. In 2002 the group demonstrated one form of FBS in the project Contestational Biology, which was developed in conjunction with artists Beatriz de Costa and Claire Pentecost and installed at the Corcoran Art Gallery in Washington DC. Contestational Biology consisted of an ‘amateur’ scientific experiment that ‘reverse engineered’ samples of the Monsanto Corporation’s Round-Up Ready corn, canola and soy products, three of the many genetically modified organisms rapidly being integrated into modern agriculture industry. 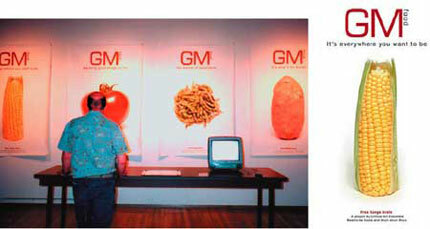 The ultimate goal of the installation, however, was to raise public awareness about the sweeping privatization of the human food supply by directly contesting Monsanto’s right to create and patent customized life forms for corporate profit. CAE’s signature approach to tactical media is a decidedly selfreflexive one in so far as the group frequently applies do-it-yourself (DIY) maneuvers to science and technology in order to reveal the underlying, ideological administration of knowledge itself. At the same time, the group links tactical media to a distinctly anti-modern form of ‘cellular’ collectivism and political autonomy. 10Blake Stimson and I elaborate on this concept of post-war collective forms our essay Periodizing collectivism, Third Text, Vol 18, No. 6, pp 573 - 585, and again in our forthcoming anthology Collectivism after Modernism for the University of Minnesota Press. For now, I want to underscore the significance to CAE of this avowed amateurism while suggesting it may also be playing a central role in the group’s recent predicament with Federal authorities. For a thirty-three-billion-dollar homeland state-security apparatus dedicated to patrolling the periphery and reinstating war-time discipline, such calls made by self-acknowledged dissidents for the founding of new, amateur forms of ‘fuzzy’ resistance may seem merely curious. Or they may appear outright devious. As military theorist Steven Metz argues, the essence of insurgency is not seizing territory, but rather sending messages to a wider audience through a type of politicized theater. 12see endnote 1. On the morning of 21 May, 2004, Steven Kurtz awoke to find his wife Hope lying unresponsive beside him. Kurtz immediately called paramedics. On arrival, the medical response team took notice of assorted laboratory equipment in the home, including Petri dishes, microscopes and test tubes. Nervously, local police alerted the FBI. 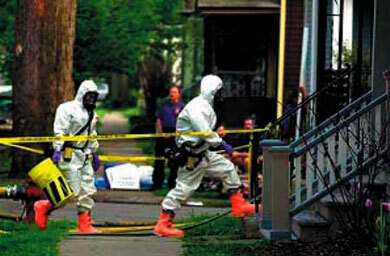 The Joint Terrorism Task Force soon descended on the Kurtz home and in a scene reminiscent of the 1971 techno-thriller The Andromeda Strain agents wearing white Haz-Mat (Hazardous Materials) suits cordoned off the house, confiscated the body of Kurtz’s wife, and gathered a variety of materials for scientific analysis. They also impounded the artist’s passport, lesson plans, books, automobile, computers, and his cat. By the next day the New York’s Commissioner of Public Health officially reported that nothing hazardous was discovered in the home and no danger to the public existed. Hope had died of a heart attack. Nonetheless, the house was under quarantine for six days during which time Kurtz was placed under surveillance for twentytwo hours. FBI agents did not arrest him, but put him up in a hotel, together with collaborator and family friend Claire Pentecost, who recently arrived from Chicago. The agency even purchased Kurtz dinner with the hopes of uncovering more information. At one point Pentecost was taken aside and asked if Kurtz had ever advocated the overthrow of the United States government. 13Related by Claire Pentecost in a presentation at The Cooper Union on October 25th, 2004. At the time of his wife’s tragic death Kurtz and CAE were finishing work on a project entitled Free Range Grains involving a do-ityourself DNA-extraction laboratory for testing for the presence of genetically altered genes, or trans-genes, in store-bought groceries. The project was to have been installed in an upcoming exhibition entitled The Interventionists: Art in the Social Sphere at the Massachusetts Museum of Contemporary Art. 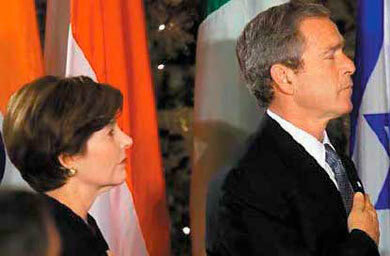 14The Interventionists: Art in the Social Sphere, Massachusetts Museum of Contemporary Art, 30 May to 20 March, 2005. It was the presence of these laboratory materials, together with three types of harmless bacteria procured for the group’s next project about the history of U.S. bio-warfare programs, which led to the investigation, because prior to the unexpected death of his wife there is no evidence Kurtz or CAE were of interest to the FBI. 15No evidence of prior interest, that is to say with this one, possibly coincidental, caveat: a lecturer at the University of Illinois at Champaign-Urbana who baselessly stated, "the Critical Art Ensemble paints a picture of cyber-resistance that looks a lot like the descriptions of bin Laden’s alleged network." Whether Heidi Brush’s paper, Electronic jihad, was noticed by Federal agents is anybody’s guess. It was, however, reported on by Kevin Featherly in Newsbytes, 16 October, 2001, and it was circulated on the internet, among other places at lists.virus.org/isn-0110/msg00110.html. Eventually, Hope’s body was returned for burial, but the FBI retained the artist’s passport, books, and computer. Still, up to this point, the incident appeared to be a case of jittery officials who, in the aftermath of the still unsolved anthrax mail murders of 2001, reacted to the discovery of a premature death and the presence of unexpected lab equipment with an indiscriminate response. That was the assumption at least until several CAE members and collaborators were handed subpoenas by Federal agents at the Mass MoCA opening that directed them to appear before a Federal Grand Jury last June. Nine people were served subpoenas by June, and while neither the FBI nor the Attorney General would make public the details of their probe, it was evident from the wording in the documents that Kurtz was being investigated under U.S. Code Title 18, Part I, Chapter10, Sec. 175: Prohibitions with respect to Biological Weapons. The scope of this statute was greatly expanded by the USA Patriot Act of 2001. So much so that some speculate even the harmless, research bacteria of the type Kurtz obtained for CAE art projects might now be labelled as a hazardous ‘biological agent’. …based on what I have read and understand, Professor Kurtz has been working with totally innocuous organisms…none of the organisms noted to be present in this case are covered, nor should they be, by the post-9/11 provisions. 16Quoted in Anti-biotech artist indicted for possessing ‘harmless’ bacteria by Brendan Coyne, The New Standard, 6 July, 2004; available at newstandardnews.net/content/?action=show_item&itemid=646. Furthermore, the bacteria purchased by Kurtz and Ferrell is often used in high school and middle school classrooms. To the surprise of no one who knew Kurtz or the work of CAE, after it met on 15 June the Grand Jury rejected all charges of bioterrorism. Once again, the unpleasant incident appeared about to conclude, with Kurtz anticipating a public apology like that extended to Brandon Mayfield, the Islamic convert from Oregon who was escorted in handcuffs from his place of work and accused of involvement in the Madrid train bombings. 17An illegible fingerprint faxed to the U.S. from Spain was later blamed for May- field’s much publicized humiliation and the FBI sheepishly admitted their blunder. Optimism was short-lived, however. On 22 June, CAE’s publisher, Autonomedia, was subpoenaed, indicating the investigation was not yet over. 18The Attorney General apparently dropped this aspect of the investigation after being pressured by the American Civil Liberties Union. Before long, Kurtz and Farrell found themselves facing up to twenty years in prison on downsized charges of mail fraud for the alleged mishandling of bacterial samples purchased from a scientific supply house. 19If Kurtz and Farrell are guilty of what they’re accused of doing, this would be no more than a contract dispute over $256 of harmless bacteria. Nevertheless, neither the company American Cultures who supplied the cultures, nor the University of Pittsburgh through which the transaction occurred have brought forth any charges. As of this writing the investigation grinds on still, and renewed charges involving bioterrorism may be lodged soon following a second Grand Jury hearing on 19 April, 2005. 20On 17 March, 2005, almost a year after the initial subpoenas were issued, Steve Barnes, another co-founder of CAE, was issued a new subpoena listing upon it the U.S. Code Title 18 Prohibitions with respect to Biological Weapons. Barnes testified on 18 April and reports that new charges of bioterror may be pending in the case. See: Artists experience déjà vu in ‘bioterror’ case that won’t go away by Brendan Coyne for The New Standard, 25 April 25, 2005; also at newstandardnews.net/content/?items=1733. 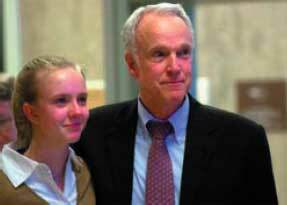 Doctor Thomas Butler with his daughter prior to being incarcerated. The public sullying of a white and otherwise privileged academic’s reputation is not unique these days. Doctor Thomas Butler, a worldrenowned specialist who researches bubonic plague, has also received similar treatment by Federal officials. In January of 2003, Butler noticed thirty vials of the bacteria missing from his lab. Assuming the samples were misplaced, but erring on the side of caution, he reported their absence to the FBI. As someone with a history of security clearance, he trusted the government and signed away his rights to legal defense. He was then arrested. “I was tricked and deceived,” said Butler on CBS’s 60 Minutes. “I was naïve to have trusted them and the assurances they gave me.” Butler was charged with sixty-nine criminal counts, including everything from bioterror to tax evasion, and even though the sixty-two-year-old scientist was, like Kurtz, acquitted of all terror-related charges, he was instead indicted for financial misconduct and has lost his job, his doctor’s license, is financially broke, and still faces several years in prison. 21See John Dudley Miller, Butler’s last stand: plague researcher may receive a long prison term in fraud case, The Scientist, Volume 18, Issue 4, 1 March, 2004; www.thescientist.com/yr2004/mar/prof2_040301.html. The National Academy of Sciences and the Institute of Medicine sent a letter to the United States Attorney General warning against “…the impact that Butler’s case may have on other scientists who may be discouraged from embarking upon or continuing crucial bioterrorism-related scientific research.” 22The letter is available as a downloadable PDF file at www.fas.org/sgp/news/2003/08/nas081503.pdf. …an unprecedented assault by the executive branch of our government upon the ability of U.S. scientists to freely share their data and insights about our world with the public. Much of the justification for this repression of scientific communication falls under the Orwellian concept of “sound science,” which is clearly understood by the scientific community to mean the misrepresentation of scientific data to reflect the administration’s political and social agendas. 25David Schubert’s commentary was published in the conservative newspaper San Diego Union-Tribune, 9 July 2004, p.7; available at www.organicconsumers.org/corp/bushscience071604.cfm. All the while this dampening effect is taking place with regard to certain types of scientific research, and as restrictive prohibitions are enacted on information sharing, the U.S. government’s spending on biological-weapons research has reached unprecedented levels. 26According to Debora MacKenzie, grants ‘for work on non-biodefence disease germs fell 27%, while grants for studying model bacteria such as Escherichia coli fell by a whopping 41%,’ Top U.S. biologists oppose biodefence boom, The New Scientist, March 2005; www.newscientist.com/channel/health/dn7074. Unlike many people who have been investigated or outright disappeared since 911, the members of CAE are reasonably well known figures within the international art world. Moral and material support has arrived from dozens of countries, and a recent auction of artwork by artists such as Hans Haacke, Andrea Fraser, Martha Rosler, Carl Andre, and Joseph Kosuth among others was staged at a major Chelsea art gallery in New York. 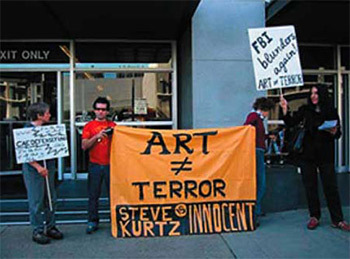 Yet, while the Kurtz / CAE case has received a relatively high degree of attention in the mainstream press and within the art world, criticism of the Federal government for its handling of this case has not been nearly as intense or widespread as the outcry during the so-called ‘culture wars’ of the 1990s. 27Martha Rosler pointed out to me that the CAE case is unlike that of Maplethorpe, Serrano et al. in so far as it has not directly implicated cultural institutions or arts administrators. Is it also possible that ‘subversive’ sexual imagery, when decried as amoral by the State, rallies those who defend individual liberty, whereas ‘subversive’ activism, when decried as terrorism, has an opposite, censorial effect? Gradually, however, these disturbing stories are beginning to align and in the process provoke an inevitable question: is the United States re-entering a period of political and cultural repression like that experienced during the Palmer Raids of the 1910s or the McCarthy era of the 1950s? Without denying the possibility of a return to such overt political tyranny, I think it necessary to make this all-too-convenient hypothesis more problematic. 28Australian artist and writer Anna Munster is one of the few to challenge assumptions about neo-McCarthyism. However, she hypothesizes a far more ominous, matrix- like "bio-logic" is at work, and that CAE was snared by its self-regulating nodal networks thanks to the chance occasion of Hope’s heart-attack. Although Munster’s novel argument suffers from a lack of historical or economic analysis, she nonetheless offers several insights, including her statement that the charges facing Kurtz and Ferrell arise from their having violated "expectations pertaining to the conduct of intellectual and cultural work." Why is bioart not terrorism? : some critical nodes in the networks of informatic life; published in the e-journal Culture Machine, no. 7, 2005; culturemachine.tees.ac.uk/frm_f1.htm. For a more grounded and thoroughly researched analysis of the CAE see Claire Pentecost, Reflections on the Case by the U.S. Justice Department against Steven Kurtz and Robert Ferrell, at: http://www.caedefensefund.org/reflections.html. For one thing, the abuse of civic and human rights has been an enduring feature of U.S. military and law enforcement throughout our history, from Wounded Knee and the conquest of California, to the annexation of the Philippines on up to the present. What has not happened to white, middle-class Americans since the early 1980s is the systematic retraction of constitutionally guaranteed civil liberties. At that time the FBI investigated and infiltrated US-based supporters of political refugees from El Salvador. For another thing, the very threat of such a return to the bad old days is useful in itself as a type of disinformation. Panic drove many in the 1950s to abandon hope of a constitutionally based, legal defense. Self-censorship and political resignation soon followed. Even the Communist Party USA, the primary target of the government’s assault, concluded it was better to go underground than publicly face what was wrongly theorized to be the rise of full-blown American Fascism. 29According to Encyclopedia of the American Left, some 10,000 people may have lost their jobs during the McCarthy Era of the late 1940s and early 1950s. (Eds Buhle, Buhle and Georgakas, Garland Pulishing NY and London, 1990, p. 459) An ideological battlefield was quickly transformed into a game of shooting fish in a barrel. Therefore,perhaps a better way to phrase our hypothesis is to ask why it is that the post-911 ideological landscape and the CAE investigation appear at once so familiar and simultaneously so very strange? It comes as no surprise therefore that capitalist marketing barely broke stride as the counter-culture blasted onto the Cold War stage during the late 1960s. Not the state, but corporate America led the way this time by converting from the production of goods to the selling of lifestyles. Patched and faded jeans, Che Guevarra accessories and the homely VW Beetle were soon the ultimate symbols of hip or what Tom Frank describes as a counter-cultural capitalist orthodoxy. 33Thomas Frank, Why Johnny can’t dissent, in Commodify your Dissent: Salvos from the Baffler, eds Thomas Frank and Matt Weiland, W.W.Norton & Company, New York and London, 1997, p.34 And while resistance to the authority of state power remains tenacious, its changing forms are no less a product of the historical moment than is nationalism, imperialism and so forth. Such opposition has run the gamut from bourgeois revolutionaries in the coffee houses of the seventeenth century, to the Paris Commune of 1871, to the turn-of-thecentury anarcho-syndicalism of the International Workers of the World (IWW). After the Second World War, the New Left turned against centralized Old Left politics as the Civil Rights and other minoritybased liberation movements re-centered anti-nationalist sentiment around individual freedoms and / or cultural identity. Curiously, even the punks overt negation of the 1960s was carried out in the name of anti-state, cultural anarchism, just as today, informal collective such as Reclaim the Streets, Carnival Against Capital and Indymedia reflect the green-anarchist and indigenous-peoples movements that are militantly opposed to globalization and centralized authority. Under the circumstances stealing the state has been transformed into stealing corporate power in order that it may be redirected towards alternative, people-centered purposes. As the activist art group Yomango insists, ‘Dare to desire: YOMANGO is your style: risky, innovative. It is the articulate proliferation of creative gestures.’ 34See:Yomango.net as well as The Yes Men, who are perhaps the finest practitioners of pilfering corporate power today at www.theyesmen.org. “Your not getting a bonus. 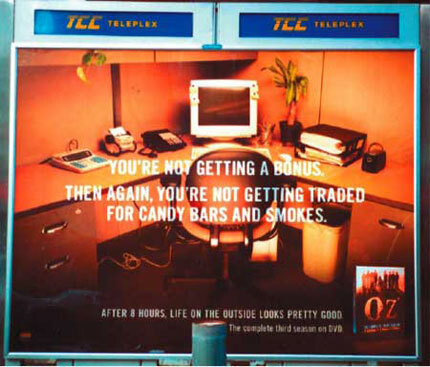 Then again your not getting traded for candy bars and smokes.” An advertisement for television prison drama OZ displayed on pay phones in Manhattan. America was adjusting its social expectations radically downward after 911 and the dot.com crash. Nevertheless it is crucial to note that powerful, anti-state sentiments are also shared by right-wing libertarians and assorted religious fundamentalists, as well as by a group of highly influential, ‘centrist’ policy makers who, not so long ago, prophesized a future in which the global marketplace would gradually subjugate national territories. NeoLiberalsm – from Reagan and Thatcher on up to Bill Clinton – is typically described as a response to the capital crisis of the late 1970s, and in his influential study The Condition of Postmodernity David Harvey argues that the floating exchange rates and financial networks of the 1980s permitted corporations to outmaneuver national interests in what he labels a regime of ‘flexible’ capital accumulation. 35David Harvey, The Condition of Postmodernity: An Enquiry into the Origins of Cultural Change, Cambridge, MA, Blackwell Publishers, first published in 1990 Even if by some accounts Neoliberalism was only a method for stabilizing U.S. national markets over and against all others, 36"It was the threat of protectionism that the U.S. used to attack those [other] countries unwilling to go global thereby transforming the impulse for nationalism itself as a means of opening up markets," in Finance and American empire, Leo Panitch and Sam Gindin, The Socialist Register, 2005, pp.24&26 a perspective that recent moves towards protectionism may bear out, one thing most analysts agree upon is that the last thirty years and up until 911 has seen a reduction of state influence in economic matters, the globalization of production, an emerging class of mobile, creative laborers, and a rise, especially evident in the immediate post-Cold War era, of a technological entrepreneurialism that prompted one noted commentator to triumphantly proclaim the arrival of “a certain uniformity of economic and political institutions across different regions and cultures,” and ultimately to theorize the end of history itself. 37Francis Fukuyma, The illusion of exceptionalism, Journal of Democracy, 1997, 8.3, pp.146-149l academic2.american.edu/~dfagel/Markets&democracyfukuyama.html. According to Holmes, the new conditions erase the division between consumption and production and worker alienation seems to vanish as “individuals aspire to mix their labor with their leisure.” Even businesses began to see themselves as a “sphere of creative activity, of self-realization” in which the new, ‘net’ worker becomes “the manager of his or her own selfgratifying activity.” 39Quoted by John Dunn in Designing a business revolution, Georgia Tech Magazine, Vol. 76, No. 2, Fall 1999; gtalumni.org/Publications/magazine/fall99/west.html. That is, at least as long as happy-work leads to a product worthy of profitable exchange. 4. The End of the Flexible Personality? 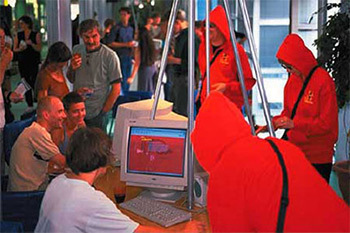 Critical Art Ensemble performance “Cult of the New Eve,” parodies the business of bio-technology corporations treating it as a “cult,” Pittsburgh PA, 2000. 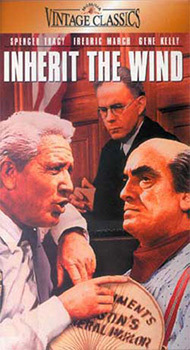 Stanly Kramer’s 1960 film version of the 1925 Scopes trial pitting Evangelical Christian theology against Darwinian evolutionary science. It is at this moment, in the glow of these softly regulated modes of precarious, creative labor, that seemingly radical styles of business management emerge directly modeling themselves after experimental, avant-garde and even critical forms of culture. Frank’s counter-cultural capitalist orthodoxy is one such example, with its rapid-fire absorption of all that is new and different, that is then re-packaged and sold back to us as an ersatz ‘otherness.’ Consider now the highly successful CEO Al West who runs a risk-management firm near Philadelphia in which employees serve on fluid, multi-disciplinary teams and re-arrange portable office furniture to suit the evolving needs of projects. 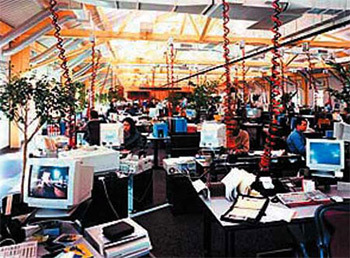 The few walls that exist inside the company’s postmodern headquarters display contemporary artwork, some of it strange and disturbing to workers. West explains that his objective is to help people ‘get out of the box.’ ‘We want them to think creatively, so why not highlight these pieces? That’s what art is all about – doing it in a different way…’ Meanwhile, West’s management theory sounds as if it came from the pages of Artforum or even the anarchist zine Clamor rather than from the Wall Street Journal. Power in the art world is shifting away from the tenured stasis of academia to cultural actors plugged directly into the entrepreneurial sector. And with this transformation, subversive ‘anti-institutional’ institutional changeability has become the defining cultural mandate of the neoliberal world order. 41Taking this one large step further, the networked operatives of the financial world who covertly seek to exploit or bankrupt other corporations and even nations, are veritable encyclopedias of tactical methodology. Indeed, one might even compare them to Al Queda agents if not for the premium they place on self-preservation. A good example is John Perkins, who "declares his guilt" in Confessions of an Economic Hit Man, Berrett-Koehler Publishers, San Francisco, 2004. Is it too far a stretch to suggest their exists a structural and historical correlation between such vanguard management ideology, with its flexible, at times experimental approach to worker productivity and happiness, and the forms (not content), of tactical media? 42President Clinton’s former Undersecretary of Commerce for International Trade, Jeffrey E. Garten, has warned that the new nationalism will lead to "escalating tensions between the U.S. and Europe over export subsidies, steel, agriculture, genetically modified food, and privacy regulations." In The politics of fortune: a new agenda for business leaders, on the website of American Economic Alert at www.americaneconomicalert.org/view_art.asp?Prod_ID=662. Significantly, it is this anarcho-capitalist dream of unimpeded financial networks and frictionless exchange that has recently hit a roadblock, or should I say ‘road-bush’? Free-market subterfuge has been replaced by pious demolition and occupation. For compared to past conservative regimes in the U.S. that have favored isolationism over militarism, the Bush Doctrine is something of a chimera. 43Ironically, it is the liberal press that appears to be calling for a return to the cultural politics of the Cold War years. In a New York Times Op-Ed piece from 9 August, 2004 the ‘liberal’ paper implored the State Department to:find new public and private partners to help it shape a coherent cultural policy and construct a broader and more open system to select and finance artists for international exhibitions. Those artists are one of the best ways of letting the world know that cultural freedom and excellence matter in this country. p. 14, column 1. With the appetite of unrepressed, freemarket capitalism, its heart is filled with the moral righteousness of missionary Christianity. (Nor can one help but notice that its body is designed for old-fashioned imperialist conquest.) Therefore, when comparisons are made between past and present instances of statesponsored oppression, contradictions of this magnitude must be factored in. Indeed, the modern state’s apparently bifurcated response to political dissent – carefully targeted, yet outright repression on the one hand and repressive tolerance manifest by commodity culture on the other – is not, strictly speaking, an ideological reaction. For despite a superficial equivalence between conservative and liberal regimes respectively, the twin tactics of state social control more accurately correspond to the changing needs and pressures arising from the need to manage unstable markets for maximum capital accumulation. In other words, if flexibility, openness and tolerance, were the watchwords of art, science and industry, especially immediately following the end of the Cold War, then the new maxims of the homeland security state apparatus are restraint, insularity, and suspicion. 44Undoubtedly creativity and innovation will remain central however to the weapons, security, and surveillance industries especially. In this sense the seemingly post-rational, political agenda of the Bush Doctrine might be a refreezing of selected portions of the de-territorialized network that Hardt and Negri posited in their influential study, Empire. Likewise, the investigation and intimidation of journalists, scientists, academics and artists may be more than just a public scapegoating of relatively powerless individuals and groups. It might instead be aimed at loudly signaling an end to the interdisciplinary, transnational entrepreneurialism that dominated the pre-911 technological, economic, and cultural environment. 45Tom Peters, quoted by Stefan Stern in A guru aims high on Prozac, www.work911.com/cgi-bin/links/jump.cgi?ID=4166 46 In dark times, 1936-1938, in Bertolt Brecht Poems, 1913-1956, eds J. Willett and R. Manheim with E. Fried, Methen Books, New York, Toronto, London, Sydney, 1976, p. 274. That is not to say that capitalism will never again chant the mantra of 90s management guru Tom Peters, “Never hire anyone without an aberration in their background.” 46Tom Peters, quoted by Stefan Stern in A guru aims high on Prozac , www.work911.com/cgi-bin/links/jump.cgi?ID=4166 Nor will it, at the mere invocation of anti-authoritarian ideas, react as it has in the CAE case, at least not based on the facts thus far. Instead, what sets this moment apart is the re-sanctification of the state as transcendent fetish and a concomitant re-disciplining of ambiguous, unmanageable forms. This includes CAE. When CAE transformed various insurgent theories – be these avant-gardist or radical-corporate – into accessible, DIY procedures, and then directed a diffuse, yet unquestionably resistant force towards select, private and governmental targets, it publicly demonstrated its ability to operate within the same nebulous terrain of power that the state now deems its privileged concession to own, lend out, or direct. Is it any wonder authorities compare CAE to terrorists? Kurtz and his colleagues sinned yet a second time and really brought down ‘the man’ when they published manuals explicating how to make use of this counter-knowledge, including its tactics and circuitry, and did so not with the ambiguous idioms of art-speak, but rather with the determined hyper-clarity of the techno-geek. They won’t say: the times were dark. Rather: why were their poets silent? Gregory Sholette is a New York – based artist and writer whose recent art projects include “Our Barricades” at Station Independent Gallery, and “Imaginary Archive” at Las Kurbas Center, Kyiv, Ukraine, and whose recent publications include “It’s The Political Economy, Stupid,” co-edited with Oliver Ressler, (Pluto Press, 2013) and “Dark Matter: Art and Politics in an Age of Enterprise Culture,” (Pluto Press, 2011). A graduate of the Whitney Independent Studies Program in Critical Theory (1996), he received his MFA from the University of San Diego (1995), and BFA from The Cooper Union (1979), and served as a Board Member of the College Art Association (1999-2004). Sholette was a founding member of the artists’ collectives Political Art Documentation/Distribution (PAD/D: 1980-1988), and REPOhistory (1989-2000), remaining active today with Gulf Labor Coalition as well as serving on the Curriculum Committee of Home WorkSpace Beirut, Lebanon. Associate Faculty for the Art, Design and the Public Domain program of Harvard University’s Graduate School of Design, he is an Associate Professor in the Queens College CUNY Art Department where he co-developed and teaches in its new MFA concentration: Social Practice Queens.